Do you enjoy “slow-sipping ” a coffee drink, sports energy drink, or tea with honey? It’s as true now as it was when you were a kid–sugar causes cavities! 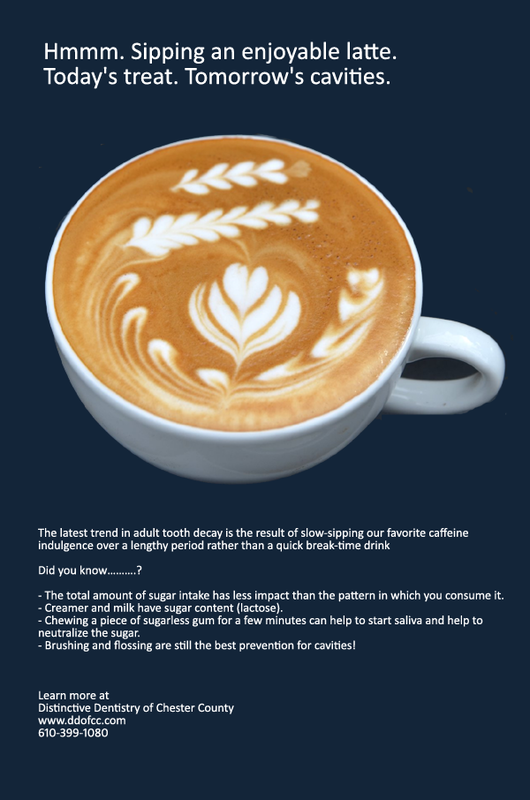 Many adults have gotten into a habit of slowly enjoying a delicious morning brew, or an afternoon pick-me-up while perusing their emails or standing on the sidelines during an evening soccer game. The introduction of sweet , whether it’s the sugar that’s part of creamers (lactose) or the kind added by the teaspoon, helps bacteria to break down carbohydrates into acid. teeth — or what dentists call “flossing cavities “. Try to have your drink like you would a snack. In one sitting, during a limited period of time–or with a meal. If possible-brush and floss as soon as possible afterwards. Drink lots of water–both before and after to rinse the sticky sugars. If its not possible to brush, floss, and rinse–chew a piece of sugarless gum. It’s designed to run out of flavor in about 10 minutes. It will help to wash away the sticky sugar. Call 610-499-1080 today and schedule your regular check up and cleaning. Nothing replaces your dental visit. March 12, 2013 | Filed under Blog.